Now THIS is how you do an event! Muzique is having it's grand opening NEXT SATURDAY, SEPTEMBER 16TH! This is an awesome and exciting time for us to be able to bring what we're doing and why we're doing it to the world! But this thing didn't come together in a snap... it took a lot of prep work, and that's what we're here to talk about today: Getting ready to spread the word about what you're doing! Whether you own a brick and mortar store or an online portal, it is important to hold a grand opening or launch party for your business! This isn’t just opening the doors or making your site live, it has to be an eye-catching event! Bells, whistles, balloons, parades (ok, maybe too far but you get the point). This has to attract your target market and other members of the community to take the time out of their day and come to your event! So we’ve assembled a little step-by-step guide to help you plan your big day… down to the nitty-gritty details. STEP 1: PICK A DATE! Some may think that this step isn’t that important… it’s about what happens on the day that matter right? WRONG! The date is most important! Obviously first check for which days you are free. Next, look at holidays and events in your area and eliminate those (you don’t want to schedule your event on the same day as another big event in your area). Then look for days that make the most sense for your target market (Friday nights, Saturdays, etc.). After that, pic what’s best for you! After all, it’s your event! STEP 2: PICK A LOCATION! Location is pertinent! If you do not own a brick and mortar store, then you will need to choose a central place for your grand opening or launch party. Think about your target market and where they are located and find a central place to hold your event! STEP 3: FIND YOUR IN FIELD CATCH! An in field catch is something that pertains to your business that will catch the audience’s attention and pull them in. For instance, if you are in the music business, have a band performing or have a sample music session, or if you’re in the home decor business, have a sample organization or simple decor class. Use this to draw in your target audience and show people what you can really do! STEP 4: FIND YOUR OUTFIELD CATCH! Your outfield catch is something that will draw in more than just your target crowd and something that is outside your realm of expertise. For instance, our grand opening will have a face painter. Yes this may be closely connected with the creative arts, but it’s not an activity that we offer or plan to offer. This is something that makes our event more enticing for people looking for a reason specifically to bring their kids to our event. We are offering a music session to sample, but this is just a cherry on the sundae! For a bakery or restaurant, an outfield catch might be having a raffle for a trip or a magician. May not directly correlate with your business, but it will draw in those that may not be naturally drawn to your grand opening. STEP 5: ADVERTISE IT! Obviously an extremely important step. Advertising isn’t just Facebook or Instagram (even though that will most likely be the way the word will spread the best), but it means you have to go door-to-door to other business for support, neighbors, etc. Send out mailers if your budget allows, hang up flyers in local stores, and find other ways to advertise in the community. On social media, create an event and share, share, share. Add yourself to groups that relate to your business and post in them! My advice: Regardless of their rules about posting, JUST POST IT! Worse case scenario the admin will delete your post but if they think their group members will enjoy your event, the might bypass the rules and let your post go! When it comes to advertising (and life), the worst someone can say is no. STEP 6: GET SOME HELP… Everyone needs a little help here and there so get it! Ask some of your friends and family to volunteer their time to either the event or the preparation, depending on where you need the help most. Remember though, don’t give away tasks that represent your business alone, these are tasks like phone calls to other business, meeting vendors, etc. ; the tasks that require the face of your business should be for you to do. STEP 7: PLAN THE DAY! Now that you have some volunteers and community support, it’s time to plan your day! 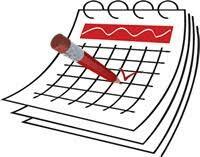 Make a schedule of events and also a schedule for volunteers. Once you have your schedule made, you can post this on your social media to share with your followers and the community! You don’t need the same people there all day long, so if you have specific events or big activities throughout the day, you can draw a more spread out crowd! STEP 8: MAKE THEM REMEMBER YOU LONG AFTER THEY’RE GONE Now it’s time for the goodies. If you are promoting your business, especially for the first time, it’s a good idea to have a takeaway item with your brand on it! Pens, bracelets, fans, stress balls, prizes, etc. For our grand opening, we were able to get donations to do a raffle and a chinese auction. This helps raise funds for our program, and people will get to go home with a nice prize if they win! Best way to do this is to draw your winners at the very end of your event, when most people are gone, so you have a reason to personally reconnect with those you came to support your event and give them your prize! If you have it in your budget, it’s a great thing for everyone to be able to bring home something with your brand on it to remember your business by! STEP 9: PLAN YOUR SPACE! Whether you are in your own space or a community venue for your event, it’s important to plan out your space. You want to leave room for your guests to walk around but also keep it tight enough for them to not wander. It’s best to set up a path for your guests to follow by spacing out your tables and chairs with a clear way to walk. Use empty spaces or confusing points to put a sign to direct your visitors where to go next! Plan exactly where you want everything to go including tables, signs, chairs, activities, food, etc. That way when it’s time for the big day, you have one less thing to worry about and the setup will be quick! STEP 10: KEEP MOVING THAT WORD ABOUT! Don’t forget to promote up until the last minute! Post everywhere and anywhere you can at least once a week leading up until your event. Keep handing out flyers to everyone you can and hanging them up. Make phone calls and send messages right up until the hour of the event! Even post a live video or post the day of your event while all of the action begins to happen to draw in more of a crowd and remind people to come! STEP 11: FINISHING TOUCHES Use the week before your event to get everything you need for the big day! Table cloths, balloons, posters, streamers, signs, arrows, etc. If you’re providing refreshments do not forget plates, napkins, cups, etc. Call your vendors the day before to confirm their arrival times and answer any questions they may have. Think about anything else that you may have to do and get it all done at least two days before. Besides phone calls to volunteers and vendors and Facebook posts, the day before your event should be about collecting your thoughts and mentally preparing for the big event. DO NOT WAIT UNTIL LAST MINUTE TO DO EVERYTHING AND STRESS YOURSELF OUT! STEP 12: ENJOY THE BIG DAY! This step is easy-peasy… just enjoy the day! If you’ve followed all of the steps and planned before the day, there shouldn’t be much to worry about. Of course every event has it’s hiccups but if you’ve planned correctly down to the last detail then the little problems that arise won’t seem so big and scary! Enjoy the day you’ve created and watch how your attendees, friends, family and clients enjoy everything you have to offer! And that’s it! After your event, you’re going to want to follow up with your audience and put out some surveys. Make sure you collect email addresses at your event, whether it’s through a raffle or a sign in sheet! Send a follow up email with a survey or a response card asking your followers to comment on the event and make suggestions! Make them feel like they are really part of the family and include them in the making of your next event! Next step after this is to begin your email funnel and dive into your social media posting. Keep your followers involved and engaged while you continue to build your email and social media following… this will bring about customers on it’s own! Let us know in the comments below if there is something you do to prepare for an event that we didn’t mention! Everyone adds their own special something so let us know what’s yours!